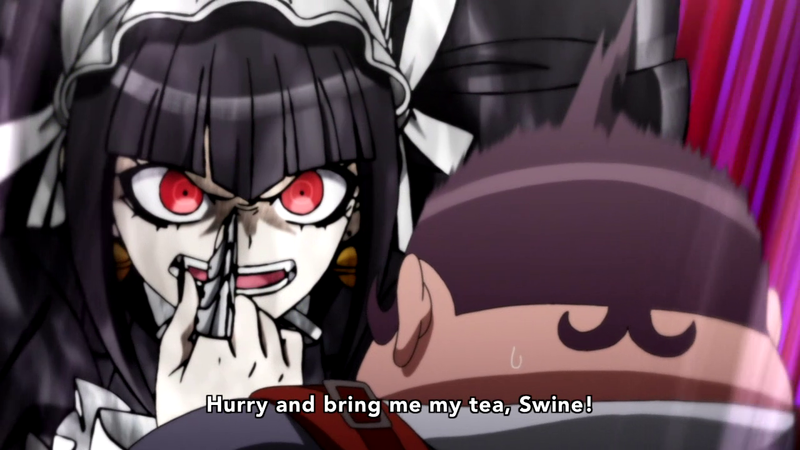 Alright, so this week’s episode of Dangan Ronpa is packed with a ton of events. We first start off with an unexpected “fanservice” scene, with Naegi reflecting on the past while taking a shower. Afterwards, the gang finds out another floor and several other rooms have been unlocked. Although everyone finds some major information in the library and seem to be cooperating well, things fall apart when Togami decides to treat everything like a game. Fujisaki tries to argue that friends shouldn’t kill one another, but Togami rejects the notion, escalating the tension even more. A true contest amongst men. The girls decide to check out the pool after the event and learn from MonoKuma about new rules pertaining to the entrance of the changing rooms. 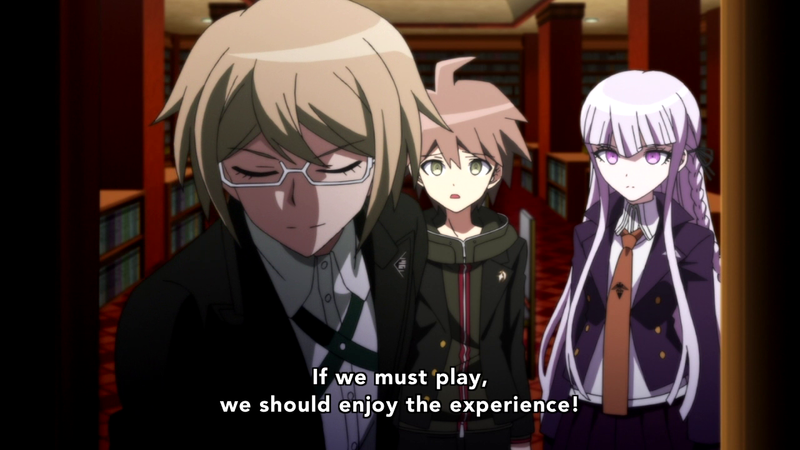 Following this event, we see a quirky scene where Naegi witnesses Fukawa’s rather extreme infatuation with Togami. Our poor Naegi can’t seem to catch a break as he is later dragged into being a referee for a manly showdown between Oowada and Ishimaru. The following day, the two dudes have become close bros and the group enjoys a moment of piece before MonoKuma summons everyone to the gym. In order to create more motives for murder, the bear gives everyone a paper describing one of their darkest secrets and threatens to reveal all secrets if someone doesn’t die within twenty-four hours. Unfortunately, everyone is woken up the next day by a warning that a certain someone has been murdered. After the group assembles, Togami quickly drags Naegi to the dressing rooms, where they find that Fujisaki has been killed and crucified. The rest of the gang soon finds out about this and a somewhat rushed investigation occurs. Togami decides to show Naegi classified data on “Genocider Syo,” a mass-murderer whom he suspects to be the culprit behind Fujisaki’s death based on the signs left behind. Before Naegi can fully grasp the situation, Asahina quickly interrupts due to some strange behavior from Fukawa. Naegi and Togami pay Fukawa a visit only to receive a strange response. Before our heroes know it, their time for investigating comes to an end as MonoKuma summons everyone for the class trial. Quite the unexpected, but hilarious outburst. This episode felt a bit more rushed, as they tried to compress the many events of chapter two into one episode. Several details were also left out from the game again, but the major details were at least conveyed. Aside from the rather fast pace of this episode, I was also surprised by the new OP, which featured MonoKuma and some traditional-style music. I definitely enjoyed how this episode showed off the personalities of several characters a bit more, but I was a little disappointed with the rushing of the investigation again. While the way they chose to execute the investigation allows for more suspense to be resolved in the trial, it could potentially confuse some of the audience. Oh well, I’m sure the trial will be exciting enough to make up for the rushed investigation, as they did a good job of leaving no hints on the true culprit in this episode. 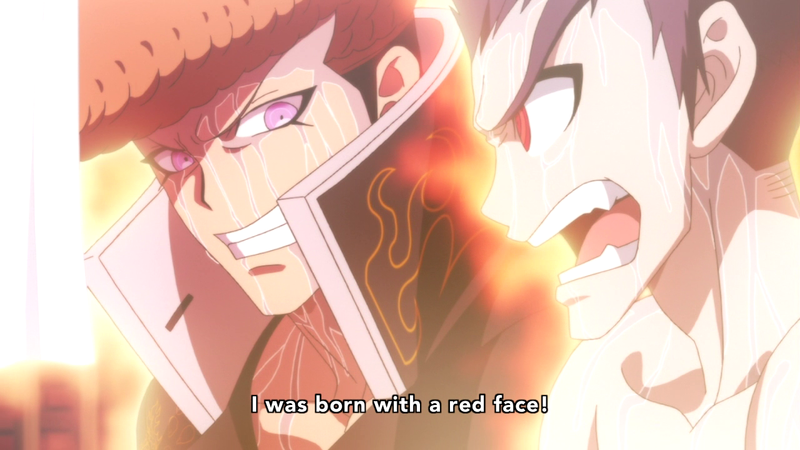 The Ishimaru and Oowada bonding was just great, it was hilarious seeing how everyone responded to them becoming bros. Quite sad seeing Chihiro go. This entire case is pretty sad really, but it’s probably because of that fact that it ended up being my favorite in the anime. And the pacing does seem to speed up, some stuff does seem pretty rushed from here on out.